Shooting starlings and house sparrows is often considered an ineffective method, due to the time required. Also, many people find that after shooting several starlings, the others quickly learn to avoid a human with a gun and keep out of range from then on. However, my experience this summer proved that a pellet gun can be an indispensable part of starling and house sparrow control. The starlings that nest in the sycamores in our front yard simply show no interest in nest boxes and do not enter nest box traps. Apparently, they only want to nest in trees, perhaps due to their past experience. As the barn mounted repeating trap began catching scores of starlings, it didn't make a dent in the front yard tree nesting population. The starlings that had nested in the various outbuildings were likely the ones that were plaguing the flickers at their nest box, while the tree nesting starlings were stealing their newly excavated cavity in the sycamore. It was only with the combination of nest box traps and pellet gun that enough starlings were removed from our yard this spring to allow the flickers to successfully nest. Also, all three of the male house sparrows that moved into our yard this season were shot when they visited a bird feeder, before they had usurped a nest box. Even though one of these sparrows killed a tree swallow in her nest box, none actually began to build in a box, so trapping them would not have worked. 1. Always use a blind!! Never let starlings or house sparrows see you when one of their brethren falls. The screen door of our upstairs porch made a perfect blind for shooting the front yard sycamore starlings this spring. I would sometimes shoot 4 or 5 in as many minutes, sitting on the hallway floor and shooting through a 4" slot in a scrap of plywood that replaced the lower screen panel. When one starling would fall from a branch 30 feet away, another would often drop down from the tree top (where I couldn't see or shoot) and land in the exact spot on this branch to peer down at the dead bird on the ground, never associating the pop of the pellet gun or the pair of eyes squinting through the plywood slot with this event. Rather, the other starlings seemed to be scanning the ground for predators. All summer long, they never caught on to the fact that they were being fired upon from the porch. Since my office is upstairs, this made the front yard starling reduction a very efficient process. The starlings at the flicker box demanded more effort on my part. This box was about 40 feet from my workshop and within view of several shop windows. I built a similar slotted blind in the large doorway of the workshop, this time of recycled metal roofing. I couldn't just stroll over and pick off a starling at will like I could in the house, because flickers were present and eventually were incubating eggs. I had to spend a great deal of time watching for the frequent starling raids since they were intent on destroying the nest. Quite a few starlings were shot while perched on the box or even in the entrance hole, but, monitoring the flicker box required frequent interruptions of my work. Later, when the flycatchers were trying to nest in the pine grove and their box was also being frequently visited by starlings, I built a portable blind from which I could monitor 8 nest boxes, including the back side of the flicker box. A chair, typing table, small electric fan and laptop computer converted this blind into a comfortable office, actually a lot cooler than our house this summer. However, watching for a starling attack at 8 different nest boxes leaves little time for watching a computer screen. But, many more starlings were shot at these boxes. Even the cheapest scope designed for 22 rifles will make medium range shots a snap. And, if you are over 45 and aren't able to focus on both the front sight and the target at the same time, a telescopic sight will be necessary. My scope cost $9.95 at Walmart and once sighted in, seldom gets out of adjustment. A scope really makes accurate shooting easy. Since you should always be shooting from a blind, the opening in the blind makes a perfect support for the barrel. If you still can't keep the target motionless and centered on the cross hairs, you need a second brace for your arms or the gunstock. 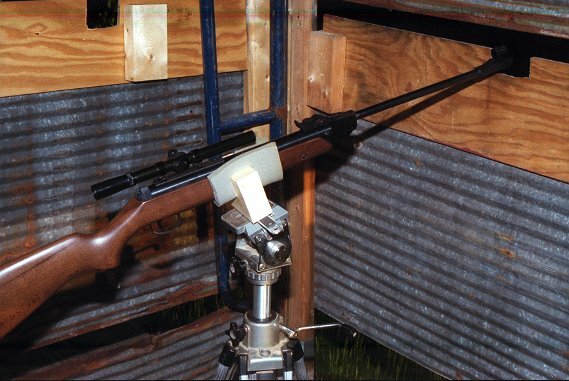 Sitting backwards on a kitchen chair and bracing the gun on the chair back can provide this support if the slot in the blind can be adjusted to allow the proper shooting angle. Using two supports in this manner is essentially like shooting a bench test. All risk of error has been removed. A tripod mounted pellet gun in the trailer blind. A simple wood cradle attaches to the tripod head and a piece of foam protects the gun stock. The tripod is adjusted so the gun barrel rests on the blind's gun port while sighted on the entrance of a nest box. This allows easy head shots of starlings or house sparrows that have usurped a nest box. However, it doesn't allow rapid repositioning if the starling perches nearby. If the blind is set up too close, you will be limited in the shooting angle and the sound of the pellet gun may become associated with the consequence. But, long shots are for marksmen, not for starling hunters. My goal is a clean and instantaneous kill, usually with a head shot every time. Whenever possible, I place the blind from 50 to 75 ft from the nestbox or tree. When the blind is in place, sight in your scope with a target at that distance. The above suggestions are for non-shooters who want to remove starlings and house sparrows from their yard efficiently and humanely. Using the above techniques, you do not have to be a good marksman to consistently make clean kills. Gun safety is beyond the scope of this page. However, it is important to know the range of your pellet gun (this varies with the type of gun) and know how this distance relates to your shooting zone. Pace it off if necessary. The area behind your target should be an open field or other unobstructed view so that you always know what is there. And, of course, if you live in a development, shooting a pellet gun is pretty much out of the question. Also, the pellet gun is the only weapon suitable for shooting starlings and house sparrows. A bb gun does not have the power or accuracy to consistently make clean kills. Birds shot with a bb gun will often end up flapping about on the ground with a broken wing. Our goal is to eliminate starlings, not punish them. Also, a 22 rimfire rifle should not be used to shoot birds. It is far too dangerous. I only fire my 22 when I know the bullet is going to go into the ground and this is hard to do when shooting birds. Even then, a ricochet off a rock can still hit someone a very long way off. On several occasions, I have used a 12 guage shotgun to shoot pigeons, but this becomes quite expensive for shooting starlings and also destroys whatever they are perched on. But, when we first moved here, farm pigeons nested in the barn, silo and anywhere else they could find. When I would flush them from the silo or barn and shoot one with a pellet gun, the others would return as soon as I was out of sight, even though they had seen their buddy fall from the air on their departure. One day I shot at one with the 12 guage as 5 flushed from the silo. Whether it was the burst of feathers in the air or the loud blast below, they never returned. So, I use noise for farm pigeons and silence for starlings and house sparrows. Caution - Only house sparrows and European starlings may be legally shot or trapped at nest boxes in the U.S. If you are not sure you can identify a female house sparrow, don't even try. Just concentrate on thinning out the males, and the females will not be a problem at your nest boxes. April 4, 2004 update: I've received quite a few emails recently asking which pellet gun is best. I haven't a clue! My experience with pellet guns is limited to only three different models and I have done no product research on the various types available. My recent experience is with a Daisy 22 cal multi-pump and a Diana spring gun. I bought the first Daisy at Walmart for around $70 - it worked satisfactorily for two weeks and then lost power. I tried a second example of the same model and it worked great for 1 week, then lost power. I cut my losses and went to a real gun store where I was sold the Diana 177 cal. spring gun for around $170. It works great and has seen extensive use in the past year. But, one objection to using a spring gun for this purpose is that leaving it cocked for long periods of time weakens the spring. When waiting for a house sparrow to land at the sparrow feeder or a starling to visit the flicker box, the gun must be loaded and cocked. There simply isn't time to do this when the bird arrives. So far, there is no indication that the spring has weakened. I always discharge the gun when leaving the blind, but it has been cocked for many hours. The Diana is also very heavy, which might be a problem for those who hand hold for long periods of time, but is great for accuracy. Both the trigger pull and the recoil of a spring gun are much greater than other guns. Don't forget the foam pad on whatever bracing device you use, in order to absorb this recoil. 2005 update The Diana spring seems to be as strong as ever. It was only fired 13 times this season - 2 times to verify the scope setting, and 11 times to shoot eleven starlings - all instant kills. The 100 percent kill ratio is not due to my expertise, but rather to my conservatism. If its not an easy kill, I don't shoot. The only real variable left when using a blind and tripod support is reaction time. It is never wise to pit a human reaction time against that of a bird. If the bird appears ready to fly, I don't shoot. &COPY; 2002 - 2010, American Artifacts and Richard Van Vleck, Taneytown, Maryland.